PROVIDENCE, R.I. [Brown University] — Brown University researchers and collaborators from Tsinghua University in China have shown that nanoclusters made from boron and lanthanide elements form highly stable and symmetric structures with interesting magnetic properties. The structure — a ring of bonded boron atoms with a single lanthanide atom bonded to each side — emerged in clusters made from eight boron atoms and two atoms of either lanthanum or praseodymium (both members of the lanthanide group on the periodic table). Sandwich structures — complexes in which two planar aromatic hydrocarbon molecules surround a single metal atom — are well known in chemistry and their discovery earned a Nobel Prize in 1973. 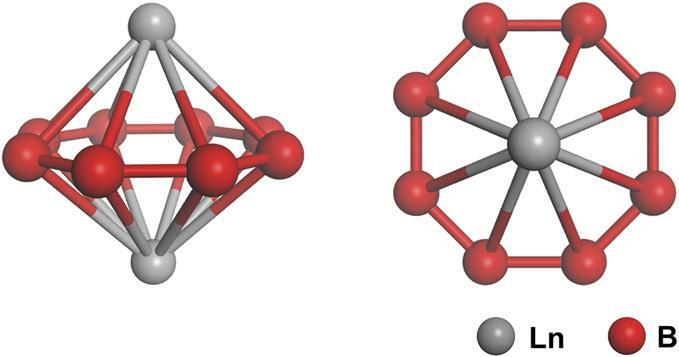 Inverse sandwich structures are known to form in uranium-organic molecular complexes, Wang says, but this is the first time the structure has been seen in boron lanthanides.